The following is the Programme of the Entertainment to be given at Staub's Opera House, on Tuesday evening, May 13, 1879, under the direction of Mrs. M. L. Binckley. 3. Comic Character Song . . . . . Miss Bettie Bates. 5. Dream of Dark and Bright Angels. Mr. Simon Shanky . . . . . Mr. John Baxter. Mr. Sampson Shanky . . . . . Mr. John Rule. Mr. Fitz Blazington . . . . . Jasper Curtis. Mrs. Shanky . . . . . Miss Binckley [Nellie Binckley]. Mrs. Mannington . . . . . Miss Hampton. 8. Gipsy Chorus, Song and Dance. 9. Solo: "Merry Maid," . . . . . Miss Mattie McCambell. Chorus Solo . . . . . Miss Bettie Bates. From: Knoxville Daily Chronicle. (Knoxville, Tenn.) 1870-1882, May 13, 1879, page 4. 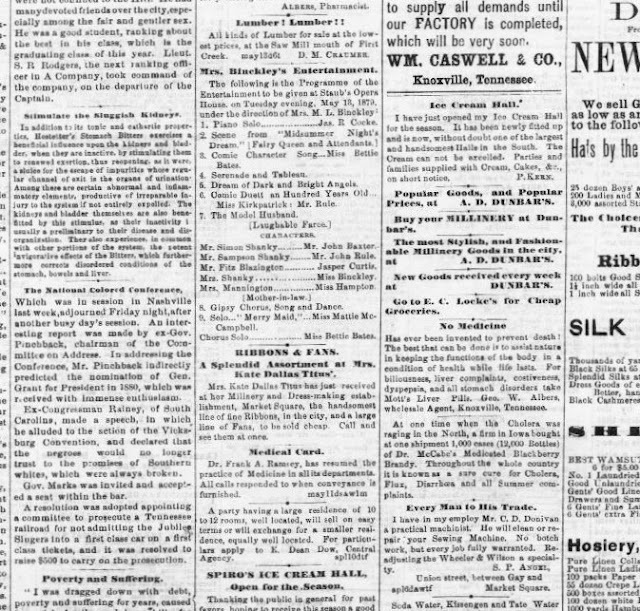 Chronicling America: Historic American Newspapers. Library of Congress. Link here. 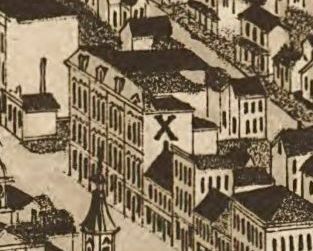 Note: Staub's Opera House (pictured above), also known as Staub's Theatre and later as the Lyric Theatre, was built under direction of Peter Staub (1827-1904), Mayor of Knoxville, in 1872, and lasted until the 1950s. From Federal Census, 1880, there was some kind of small boarding school, probably conducted by Jane Mary Wood Johnston Mitchell/Michel (1811-1892). Which makes one wonder: where was Mary Louisa Mitchell/Michel Binckley at the time of the 1880 Census? John Milton Binckley, her husband, had died in Milwaukee on May 4, 1878. Given misspellings of names, more may be revealed at some point once figured out. There is an anomaly here, also: Lilian Johnston Taliaferro was only a child at the time, not 21. 'The Model Husband' may have been written by Mary Elizabeth Braddon (1835-1915); first performed in 1868.